Daniel Paul’s statement about his brother holds true in a broader sense. Longstanding Mi’kmaq Chief Lawrence Paul’s negotiations in Nova Scotia with provincial and federal governments were ground breaking; he went against the flow early on and opened doors for 500-plus First Nation bands across Canada, as well. “He had the gift of gab and he had the ability, perhaps, to use a little shame on people so they would come forward and do better than what they’d been doing,” said Daniel, a noted writer and historian. In 1984 when his band was $4 million in the red, Lawrence stepped in as chief and eliminated the debt in two years, initiating a new program of economic development. By acknowledging his band’s inherent strengths, and working closely with the prevailing economic and governing structures of the day, he championed economic success in his community. Nova Scotia Premier Stephen McNeil said Lawrence was a tireless and dedicated leader. His efforts led Lawrence to be named one of Atlantic Canada’s top 50 CEO’s by Atlantic Business Magazine. Born in Saint John, N.B. in July 1934, the ninth eldest of 14 children, Lawrence moved with his family at the age of eight to the Indian Brook reserve near Shubenacadie, Nova Scotia. At that time education was mostly out of reach and Aboriginal people weren’t allowed to vote. The fact his brother went on to achieve so much on behalf of Millbrook is a testament to his ability to see what needed to be done and then figure out how best to get that accomplished, Daniel said. Lawrence served in the army, worked in fisheries enforcement and as an economic development officer before moving to Millbrook, near Truro, because of his marriage to his first wife. He was elected councillor in 1974, serving for four years, and was elected to council again in 1980. Between 1984 and 2012 he won 14 consecutive two-year terms as chief, defeated finally by Robert Gloade. As early as the 1970s, Lawrence envisioned retail activity that would make his community solvent. In the early 2000s his council obtained a federal grant and provincial support to build a highway interchange that connected the Millbrook Reserve to Nova Scotia Highway 102. The new exposure ushered in development of the Truro Power Centre and Millbrook now leases the site to Aboriginal and non-Aboriginal tenants who run fast food restaurants, hotels, cinemas, gas stations and other businesses. A band-owned aquaculture facility that raises Arctic Char is also located on the site and a new housing development was created nearby. Millbrook First Nation partnered other investments under Lawrence’s leadership, including a new building to house a General Dynamics helicopter support facility on its Cole Harbour Reserve, a wind energy project, and a planned deep-water port in Melford, N.S. The band has developed wharf facilities and maintains small fishing fleets. It also operates the Glooscap Heritage Centre and established the large Glooscap statue overlooking Highway 102. Former federal fisheries minister Herb Dhaliwal was one of more than 200 people who packed the tiny Sacred Heart Catholic Church in Millbrook after Lawrence’s death on May 28. Dhaliwal negotiated long and hard with Lawrence to reach a fishing deal for the Millbrook First Nation, one of dozens hammered out in the wake of the 1999 Supreme court of Canada decision affirming a treaty right to hunt, fish and gather. “He was a determined man for the betterment of his community and for the betterment of his country,” Dhaliwal said in the Halifax Chronicle Herald News. Eulogized by niece Violet Paul at his funeral, funeral-goers learned Lawrence loved Johnny Cash music and chain-smoked with all the windows rolled up on road trips. Jack Paul, Lawrence’s eldest son, quoted in The Truro Daily News, recalled a time when his father may have been considering a run for the Assembly of First Nations’ top position. Family members speculate Lawrence would not have made good on his bid to lead the Assembly because of his fear of flying, wondering how he would have travelled to unending meetings with chiefs across Canada? Childhood games were to blame for Lawrence’s disdain for airplanes, according to Daniel. He and his brother were just like every other little boy on the Indian Brook reserve during the Second World War – always pretending they were soldiers. “Air force pilots were making low-level runs … they were flying almost at the tree tops and Lawrence made a beeline for this one tree and climbed way out to the top of it. The airplane almost came over that tree. “The tree was swaying back and forth. Lawrence came down much faster than he went up,” Daniel said. 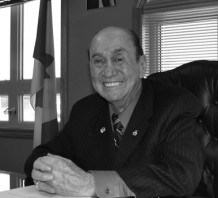 In his life, Lawrence received numerous awards and honours, including an Honourary Doctor of Laws from Halifax’s Saint Mary’s University. He was married three times and had seven children.